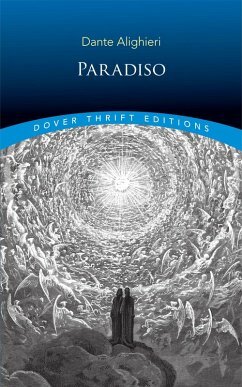 The last great literary work of the Middle Ages and the first important book of the Renaissance, Dante's Divine Comedy culminates in this third and final section, Paradiso. The 14th-century allegory portrays a medieval perspective on the afterlife, tracing the poet's voyage across three realms — Hell, Purgatory, and Paradise — to investigate the concepts of sin, guilt, and redemption. Expressed in sublime verse, the trilogy concludes with this challenging and rewarding venture into the dwelling place of God, angels, and the souls of the faithful.Guided by Beatrice, the incarnation of beatific love, Dante undergoes an intellectual journey from doubt to faith. Beatrice instructs the poet in scholastic theology as they pass through the nine spheres of Paradise to the Empyrean, a realm of pure light in which the redeemed experience the bliss of God's immediate presence. 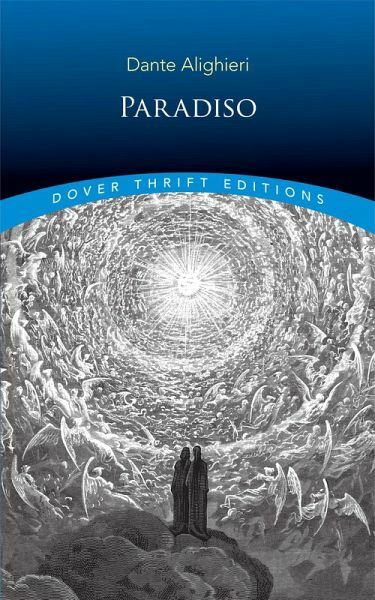 This edition features the renowned translation by American poet Henry Wadsworth Longfellow and serves as a companion volume to the Dover editions of Inferno and Purgatorio.